Sean McKay, Vice President of Business Development at American IRA-a National Provider of Self-Directed IRAs, announces free 'Rules of The Road' March 27th Webinar. This webinar was developed to help get the word out about things that people need to avoid within their self-directed IRA so that they can properly acquire assets. We developed this webinar to help get the word out about things that people need to avoid within their self-directed IRA so that they can properly acquire assets. Sean McKay, Vice President of Business Development at American IRA-a National Provider of Self-Directed IRAs, announces free 'Rules of The Road' March 27th Webinar. Sean Mckay says "We developed this webinar to help get the word out about things that people need to avoid within their self-directed IRA so that they can properly acquire assets. The feedback we received from our first month of these webinars was so overwhelmingly positive that we have decided to continue to offer this webinar each month." *They cannot buy property from their IRA. *They cannot sell property to their IRA. *Their relatives, defined as ascendants and descendants and their spouses, may not buy from or sell directly to their IRA. 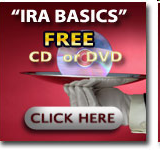 *Their IRA cannot engage in any of the above transactions with any entities controlled by their ascendants, descendants, or any of their spouses. *Their IRA cannot engage in transactions directly with their accountant, financial advisor, tax attorney or anyone else who advises them on their IRA, nor with any business entity they control. Sean interjects, "In plain English, this means they cannot use their IRA directly for their own benefit, nor that of those related to them, and their advisors cannot manipulate them into using their IRA to benefit themselves. Their IRA exists for one purpose only: To provide economic security for them after they turn 59½. Anything they cause their IRA to do that is contrary to that purpose runs the risk of generating taxes and penalties." The mission of American IRA is to provide the highest level of customer service in the self directed retirement industry. Mr. Hitt and his team have grown the company to over $250 million in assets under administration by educating the public that their self-directed IRA account can invest in a variety of assets such as real estate, private lending, limited liability companies, precious metals and much more! Sean McKayVice President of Business Development at American IRA Visit Our Website For a Free Informational CD or DVD About Self-Directed IRAs.Educating the public that their retirement account can invest in a variety of assets such as real estate, private lending, limited liability companies, precious metals and much more!